Sesame is believed to possess magical powers, and the famous magical command 'Open Sesame' from the folk tale "Ali Baba and the Forty Thieves" is in our memory from childhood. Can you believe that sesame seed truly has magical power? Sesame is one of the oldest products cultivated since the olden times, and is said to be one of the oldest seasonings used. 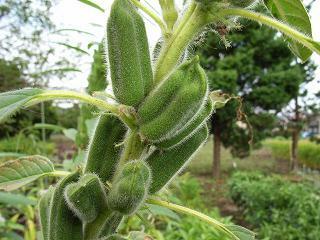 Sesame has long been used as a food, medicine, and for cosmetic applications. and many other important nutrients, including powerful antioxidants. 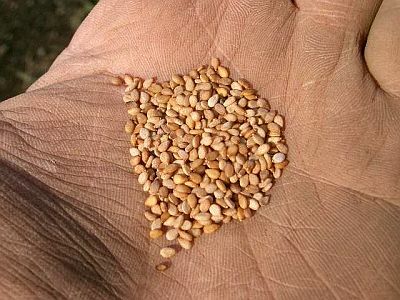 According to some historical records, sesame seed is said to be the origin of the African grass, which has now spread around the world for its magical cooking power. Historical records show that in ancient Egypt, people used to drink sesame oil mixed with honey as a health drink. 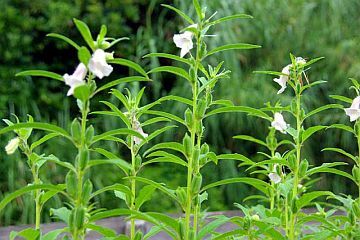 Ayurvedic medicine in ancient India as well as Traditional Chinese Medicine shows that sesame oil is regarded as God's gift. Sesame seed was used by Egyptians as a medicine as early as 1500 B.C. Sesame seed is widely present in our diet nowadays because of the best and wonderful sources of active ingredients packed in this tiny grain. As an Antioxidant – a special element called "sesame-lignin" helps get rid of free radicals that cause aging and cancer, including fatty acid production. Cholesterol reduction – sesame seeds are effective for atherosclerosis as it has been confirmed by various experiments. Prevention of hangover – sesamin from sesame seed helps in the liver function by breaking down alcohol effect and detoxifying harmful substances. If you drink, we recommend you take a lot of foods like sesame salad and sesame tofu. Beauty treatment – sesame seed and sesame oil are now commonly talked about among beauty enthusiasts. Modern science discovered that sesame seed has been used traditionally for beauty. Initially, scientific findings show that the seed and its oil can keep the skin healthy and make the hair stronger. Stress prevention – scientific studies indicate that stress contributes to range of diseases. Because of sesame seed's chemical structure, it has a unique ability to reduce tension and stress when used regularly. It also helps nourish the nervous system, and relieves fatigue and insomnia. Overall, it helps provide optimum vitality and strength. Cancer prevention – sesame seeds contain "phytate", which is one of the most powerful antioxidants and one of the most potent natural anti-cancer substances. It helps inhibit the growth of various cancer cells. Relieve constipation – sesame seeds contain a lot of fiber that provide roughage to the stool, which softens the contents in the intestines and making it easier to eliminate. Iron and calcium contents of sesame seeds are valuable in anemia and prevention of osteoporosis, too. It's a common procedure to sprinkle toasted sesame seeds over breads, cakes, or other foods. But that's not the right way. Toast the sesame seeds until you hear a single popping sound (it may take about 20 seconds or even less). Grind the seeds until it becomes oily or pulverized. 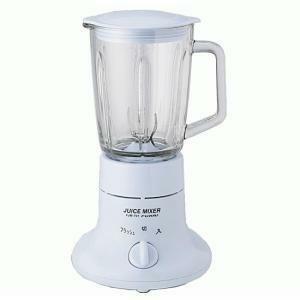 You can simply use an electric mixer for the purpose. 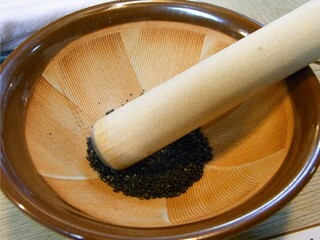 Most houses in Japan use earthenware mortar for grinding sesame seeds as shown in the photo below. Spread the ground sesame seeds over the cakes, bread, soup, rice, salad, ice cream, and anything you enjoy eating.